Lush Kitchen is quite a new part of Lush. They make small batches of classic Lush products, something that used to be called Retro, but they also make exclusive products, or advance order products, again all in small batches.They also do regular G+ hangouts where the Compounders (the guys & gals making the products) & the Inventors (the people who come up with the products) talk about the ingredients they use, or where they source the ingredients, or inspirations behind the products. Yada Yada Yada – Tell us about the stuff you got! I love the ballistic Lush make called Avobath, it’s bright green, full of avocado, lemongrass oil and bergamot. Add them all together it’s brilliant. It’s great & citrusy for the summer & then also has really big powerful scent for the winter, specially if you’re full of cold, plus it’s got loads of avocado that’s super for the skin. This smells nothing like it. I know, should have read the ingredients better, and I’d have know it was packed with pine oil, but there’s a little bit of panic when you see you’ve only got 30 min to complete your order once you’ve put a Lush Kitchen product in your basket, so I didn’t. 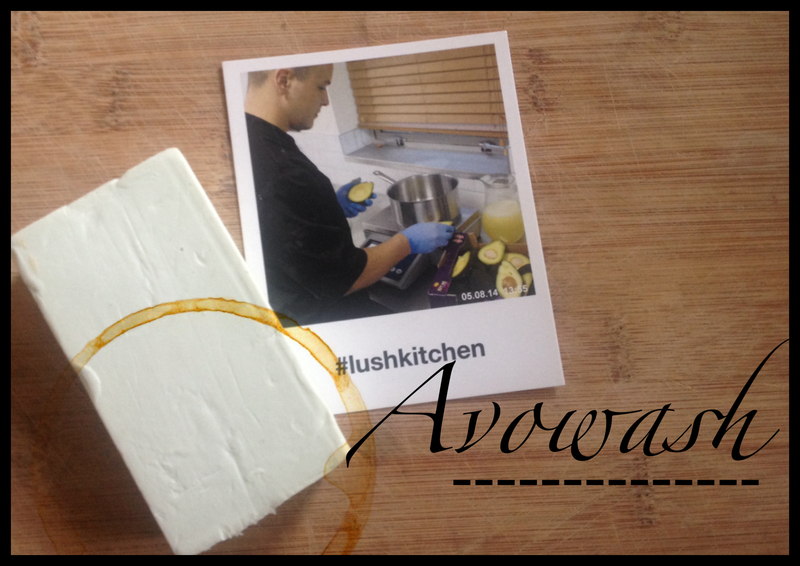 Avowash is £4.25 per 100g and is only available through Lush Kitchen. This is what incited me to place the order. A massage bar made with coffee. There hasn’t been a coffee product in Lush since Vanilla in the Mist, a really great soap that made you smell like a vanilla latte. But Percup is not a soap. It’s a massage bar. It’s a beautiful chunk of fair Trade Organic Cocoa Butter & Fair Trade Shea Butter blended with some gorgeous ingredients. The massage bars melt surprisingly quickly in your hands, even my perpetually cold hands, and you can use it for massage (and they do in Lush Spas) or, as I did with this, use it after the shower (or bath) as a really great body lotion. 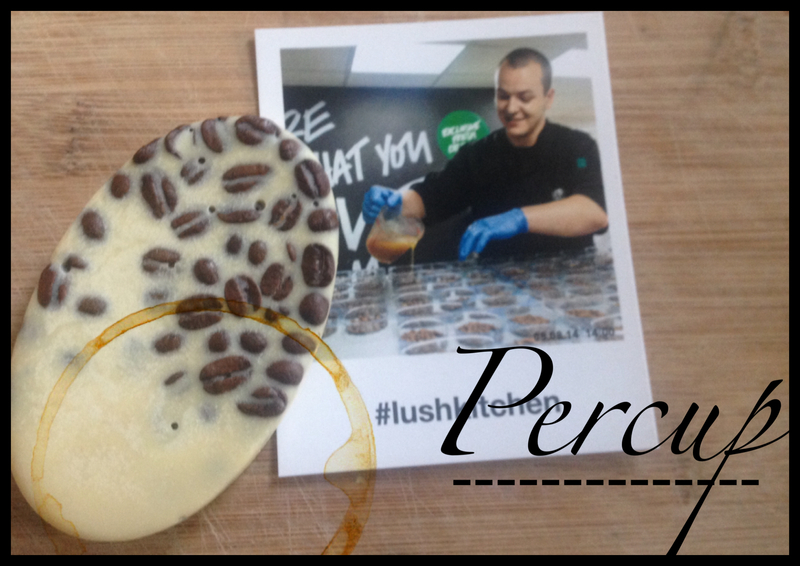 As well as the shea & cocoa, Percup has organic jojoba oil and extra virgin coconut oil. All of those by themselves are great for skin, wrapped up together with the coffee beans, vetiver oil and fair trade vanilla, it’s freaking UHMAZING! It’s a real sweet & warm scent, like the smell of your local coffee shop in the morning when they’re still baking the pastries, and steaming the milk for lattes while you’re sat at the bar with a perfect espresso. Even 8 hours after I’ve covered myself in it, I still want to lick my own arm. Unfortunately, Percup isn’t edible. Sometimes, allegedly, products that start in Lush Kitchen will then end up in the stores. I hope so, because I think I need this in my life all the time! If I’ve tempted you with these products, then be quick! The menu at Lush Kitchen changes frequently, and they might not make these again. Postage is about £4, so this package cost me just under £15. Anyone tried something from Lush Kitchen? What are your favorite Lush Products?